This simple, 4-ingredient dish is one of the simplest, most elegant Italian recipes I have. It’s very easy to prepare. It presents well. It’s delicious. Even my kids ate it. Below you see the happy family of ingredients. Be sure to use the best prosciutto and best cheese you can find, as in my experience, the lesser varieties have a much higher sodium content. In fact, this dish needs no extra salt added. First, trim the spears if necessary. Then the asparagus needs to be either par-boiled or slightly steamed. You don’t want to fully cook them in the first step as they have more baking to do in the oven. (If you have the time, but it’s not completely necessary, plunge the spears in ice water to stop the cooking.) There is a school of thought that says asparagus tips should never touch hot water, that they should be steamed upright so as not to offend and annoy or otherwise ruin the delicate tips. I did read in a 40+-year old cookbook that it was acceptable to steam your asparagus in a coffee percolator. This is back when we all had percolators instead of quickie Keurig or Nespresso machines. 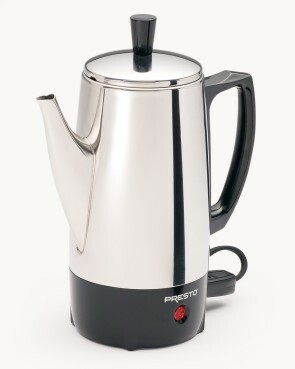 Remember these percolators like the one below? Years ago one of these was a life-saver for me when I had to spend two months living in a hotel room in Buffalo. (Don’t ask.) This was before singular coffee machines were invented and hotels became thoughtful enough to stock them in rooms. My Buffalo percolator was a red plastic Presto. But I digress. Anyhow, figure out your best method for slightly cooking your asparagus. After this step, divide them into 4 bundles with 6 or so stalks each. Gently wrap a slice of prosciutto around the lower end of the bundle. This is easier said than done as it’s hard to pull prosciutto slices apart from each other. Hard but not impossible if you’re careful and patient. Be sure not to shove all the prosciutto in your mouth as you’re completing this step of the recipe. Ahem. 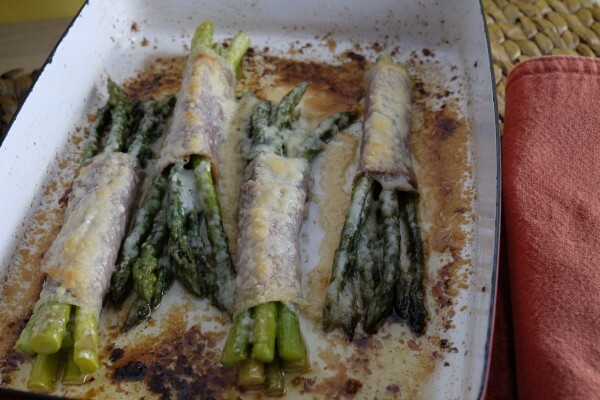 Once you’ve constructed your little asparagus bundles, place them in an oiled baking dish. Pour two tablespoons of the melted butter over them. Sprinkle on the parmesan cheese. Pour on the remaining tablespoon of butter and your construction is complete. Bake in a 400F oven for 15 minutes, until the asparagus bundle is slightly browned. If you find these bundles too salty for your taste you can do one of two or both things. Exchange the prosciutto crudo (uncooked) for slices of cooked or boiled ham. 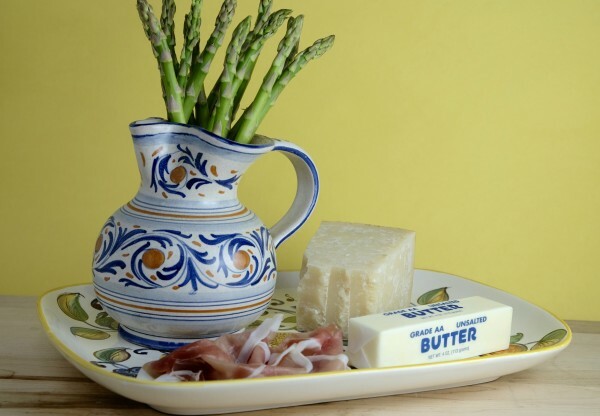 You can replace the parmesan with a slice of fontina cheese, which is great for melting and not quite as salty. Or you can do both. I did neither and toughed it out with this delicious Italian side-dish, what the Italians call a contorno. Enjoy. Trim the asparagus spears and steam them until they are just al dente. Plunge in cold water to stop the cooking. 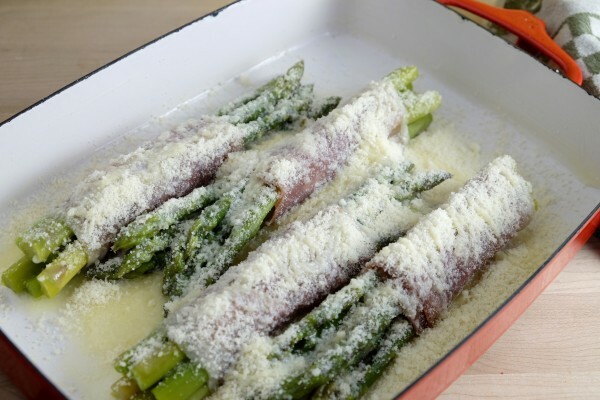 Wrap a slice of prosciutto around a bundle of six asparagus stalks. Make 4 of these and lay them in a shallow baking dish. Drizzle 2 tablespoons of butter over the bundles. Pour the remaining tablespoon of butter over the bundles. Put the dish in oven and bake until well-browned, about 15 minutes. Then serve. 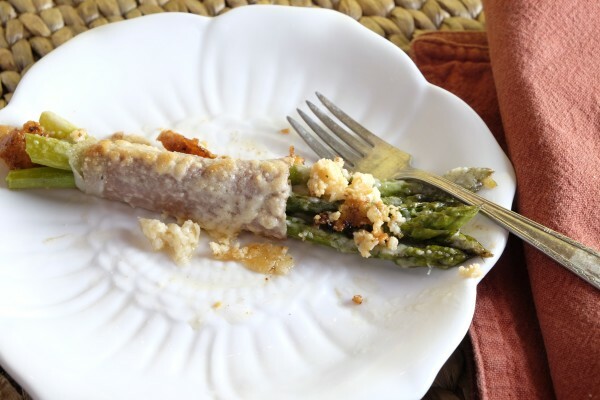 We just had a very similar – tho’ I suspect not quite as tasty – asparagus dish just yesterday! Just coincidence or a cosmic reminder to ask for the story on that Buffalo gig? Hello Anthony, try this recipe and let me know what you think. Will explain the Buffalo gig this summer in Italy. 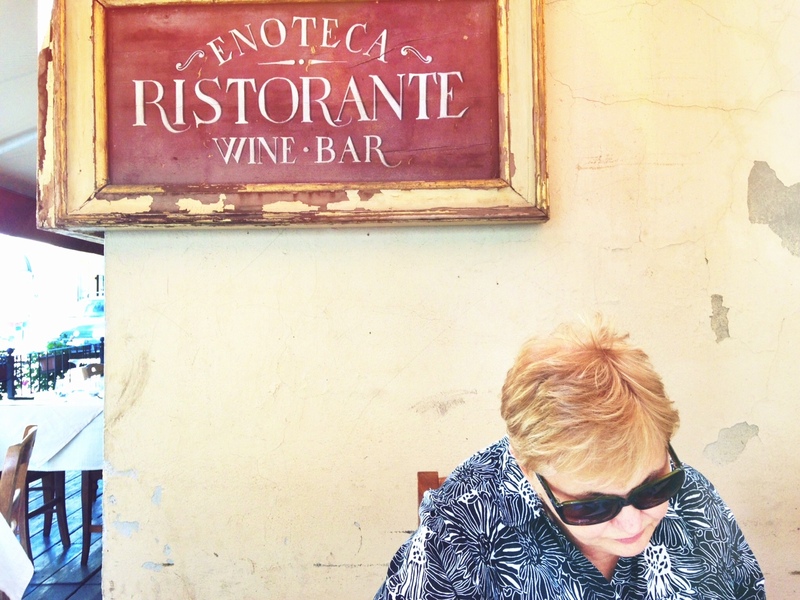 Stay tuned for an upcoming post that lists the 10 mistakes tourists make in Italy. Be there or be square.